OSKEMEN – Today an extended meeting of the East Kazakhstan Regional Commission for Juvenile Affairs and Protection of Their Rights took place in Oskemen, and was dedicated to ‘Modeling Interaction of Institutions and Experts on Child Rights and Juvenile Probation’. The event was arranged by the Akimat (local authority) of the East Kazakhstan Region, jointly with the Committee for the Criminal Executive System of the Ministry of Internal Affairs, with the United Nations Children’s Fund (UNICEF) in Kazakhstan and Penal Reform International (PRI) in Central Asia, with support from the Delegation of the European Union to the Republic of Kazakhstan. The main purpose of the meeting was to strengthen the role of the co-ordination mechanism, to protect children’s rights and to model a probation system for minors, while reviewing best international practices in implementing probation for children in contact with the law. Welcoming guests and participants, UNICEF’s Representative in Kazakhstan, Mr Yuri Oksamitniy, stressed the importance of the meeting in promoting the protection of child rights, information exchange, and co-ordination between key partners. He also highlighted the main areas of UNICEF’s work on children’s rights in the East Kazakhstan region, and some achievements of the joint EU and UNICEF programme on ‘Strengthening the Justice System for Children and Protection of Their Rights in Kazakhstan for 2014-2017’. International consultants presented the main results of documentation from Kazakhstan juvenile courts and their recommendations for improving the function of the juvenile justice system in the Republic of Kazakhstan. International probation expert, Mr Vladimir Popa, from Moldova, talked about the experience of piloting a probation service for juveniles in conflict with the law in the East Kazakhstan region and conducting workshops for probation officers working within the penitentiary system, as well as for representatives of the Prosecutor’s Office, courts and local executive bodies. Participants also discussed the integration and interaction of institutions and of experts working within the field of child rights and juvenile probation. 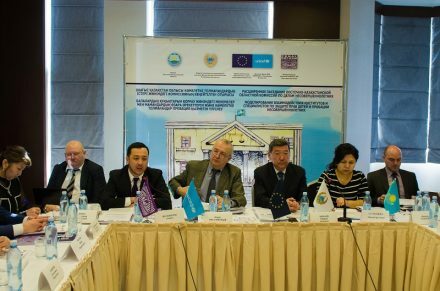 The extended meeting was attended by representatives of the National Centre for Human Rights, alongside representatives of the Committee for Child Rights Protection, the Ministry of Education of the Republic of Kazakhstan, the Committee for the Criminal Executive System, the Ministry of Internal Affairs, and by prosecutors, courts and local executive bodies in the East Kazakhstan region, as well as by representatives of international and public organizations.